Let’s face it, being a parent to an infant is not an easy job. An apparently simple task of putting the baby to sleep can turn into a total nightmare. I am sure you vividly remember the sleepless nights and the groggy, tired mornings that follow when your precious bundle of joy just refuses to go to sleep. The good news is that you are not alone. Thousands of parents all over the world share your experience. But the question is, what can you do? Well, one of the best solutions that many parents use is a baby light show projector. As the name suggests, a baby light show projector is a small electronic machine that projects images of objects throughout the nursery. The projected images and lights have a soothing and calming effect that helps the baby to fall asleep and encourage a consistent sleeping pattern. Some projectors also come equipped with a lullaby music generator that makes the job of a parent that much easier. These projectors have been a lifesaver for my family and me. But buying the best projector is not that easy. There are so many options that choosing the best one can take hours of online research. Now, as a mother, I know how busy you are. You don’t have the time to go through the hundreds of products online, now do you? Well, that is where I come in! I did all the research so that you don’t have to. In this detailed review, you will learn all you need to know about baby light show projectors so that you can shop like a pro! You will also see some my personal favorite projectors on the market that are worth your time and money. So, read on and let me help you to put an end to those sleepless nights! Baby light show projectors have many advantages for both the kids and parents. Some of the ways in which these projectors can help are as follows. Infants have a shorter sleep cycle, and they tend to wake up many times during the night. The light show projector can keep the babies engaged when they wake up, and the calming and soothing patterns help them get back to sleep. If you have a toddler who is afraid of the dark, a projector can provide a sense of safety and security. No more getting scared in the middle of the night. Another great benefit of these projectors is the fact that they provide enough light for those midnight diaper changes. You don’t have to put on a bright light to get the diaper change done. If you are a new mother who likes to check on your child from time to time, the projectors let you do just that without disturbing the sleeping angel. And finally, they look great! Now that you know how helpful these projectors can be, it the time to check out the features that the best baby light show projectors must have. 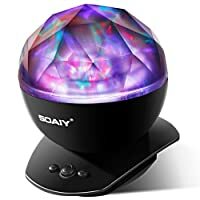 How to Choose The Best Baby Light Show Projector? As I mentioned earlier, there are thousands of projectors in the market. But before you buy a projector for your child, you should pay attention to the following things. 1. Where is the power outlet located? Most of the baby light show projectors need a power outlet to work. Take a look across your child’s room and spot the power outlets that you can spare for the projector. Make sure that the electrical outlet is neither too near the baby’s bed or crib not too far. If it is too near the baby, the light may be too bright and will keep the baby awake. If it is too far, the light may be too dim. Find a suitable place to maintain the projector before you go ahead and purchase one. 2. What is the color of the projected light? Another important aspect to consider is the color of the projected light. The color of the light can have a profound effect on how well your baby sleeps. For instance, blue light (light of shorter wavelength) acts as a stimulant and can keep the baby awake. You need a light that has a longer wavelength like red or orange. Our bodies are programmed to associate red and orange colors with the end of the day and time for sleep. Think about it, what is the color of the setting sun? It is nature’s way of letting us know that the day has ended and it’s time to sleep! 3. Does the projector come with a timer? If you don’t want the projector to stay on for the whole night, look for the timer feature. Many projectors come with this feature that allows you to determine how long you want the projector or the music to run before it automatically shuts off. It is a good way of saving on energy as well. 4. What is the brightness of the projector? The best baby light show projector should not be too bright. After all, the purpose of these projectors is to provide a soothing and calming light, isn’t it? If the light is too bright, it may cause the child to wake up frequently, which is counterintuitive. It is easy to tell if a light is too bright. Just switch on the projector at night and close your eyes and face the light directly. You should not see a bright light through your eyelids. You can adjust the placement of the projector to fine-tune the light. Sometimes, keeping the light away from the crib or bed can result in dimming down as well. Some light show projectors come with some additional features as well. 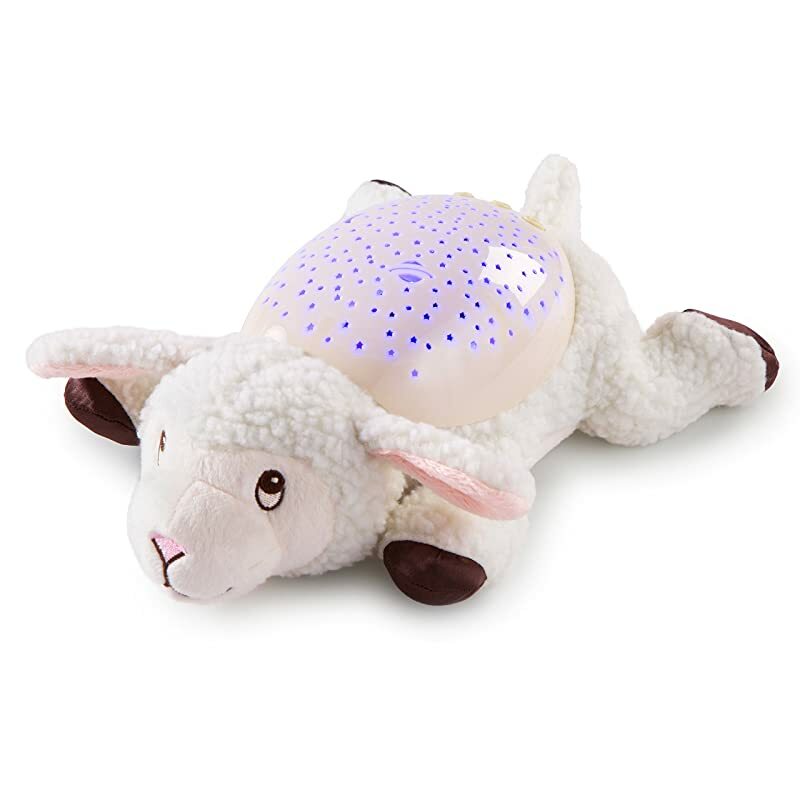 Some of them include lullaby generator, temperature sensor, and even a clock. If you want any of these functions, you can look for them. Another great feature that some projectors have is a motion sensor. These projectors are turned on automatically if there is some movement in the room. So, now that you know what to consider in a baby light show projector, it is the time to see the best products that you can buy and why are they so good! It is one of the most popular baby light show projectors on the market. 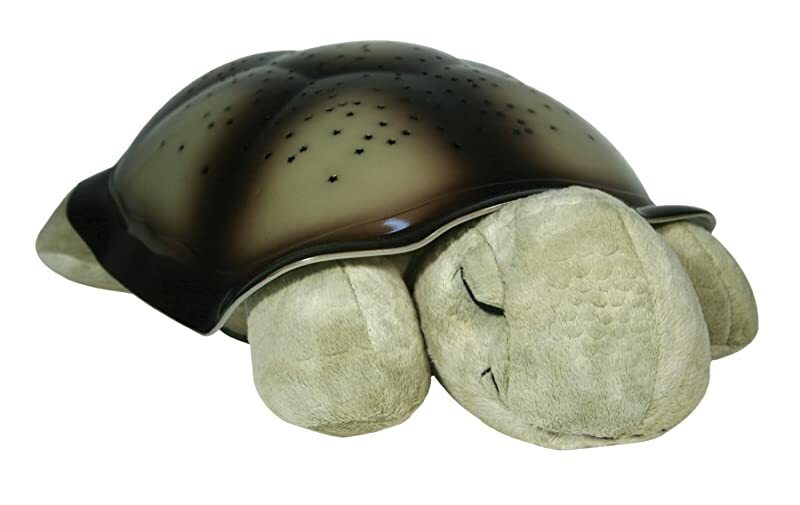 Shaped like a cute little turtle, it is a great product. You can even choose the illumination color as well. Here are some of the features of this projector that I love. It displays a full night sky with a crescent moon and lots of stars. The best thing about this projector is the fact that it projects eight familiar constellations! The package also comes with a chart to help your child identify these constellations as well. It is as much fun as it is educational! Operating the Cloud b Twilight Constellation Night Light is also very easy. It just has one single button on the shell of the turtle that when turned on, starts the projector show. It projects continuously for 45 minutes before automatically shutting itself off. The projector runs on three AAA batteries. There is no need to scamper for an open outlet. You can place it anywhere in the room you want. The shell of the turtle can be adjusted to glow in three different colors- blue, green or amber. Also, if your child wants a different animal, you have that option too. You can get the projector in the shape of a lady bug available in both pink and green colors! The video bellow is a review of Daddoes for this Twilight Turtle. Although the projector enjoys a high rating amongst customers, there are a couple of complaints as well. Some parents complained that the amber color is not as bright as blue or green. If you have dark walls, it may not work properly. Some parents also complained that the plush part of the projector is not properly glued to the shell and it can come off. Although, most users don’t have this complaint. It is one of my favorite projectors on the list. My son loves this product a lot. It is a simple design with a single-color projection of a starry night. It is one of the best-selling projectors as it is packed with additional features. The projector projects a starry night on the walls and ceiling. The color of the projected light is fluorescent green that is not too bright neither is it too dim. One of the best features of this projector has to be the inbuilt songs and nature sounds. There is five meditative songs and nature sounds to choose from as well. Also, the unlike some other sound producing projectors, there are three levels of volume adjustment. Another option that I love on this projector is the timer. It has three timer levels- 15 minutes, 30 minutes and 45 minutes. I like the possibility of being able to control the timer for a shorter interval. Sometimes, when my son is tired, 15 minutes will do just fine, and the projector does not have to run unnecessarily. The projector is available in various characters including Eddie- the elephant, Bella- the butterfly and Betty- the bee! Most parents using this product are very satisfied with it. However, a few have experienced some problems. Although there is an option to turn the volume to a low setting, some parents think that the low is still quite loud. The buttons are not easy to see at night, although it is not a deal breaker. It is one of the most elegant projectors on the list. Rather than using the starry night projection, the Ocean Wave Projector uses the soothing effect of light reflecting from a calm ocean. It is so soothing and relaxing that sometimes I feel that I should have it in my bedroom! Let’s check out this awesome projector in detail. While most of the light show projectors rely on a starry night, this projector uses ocean waves. 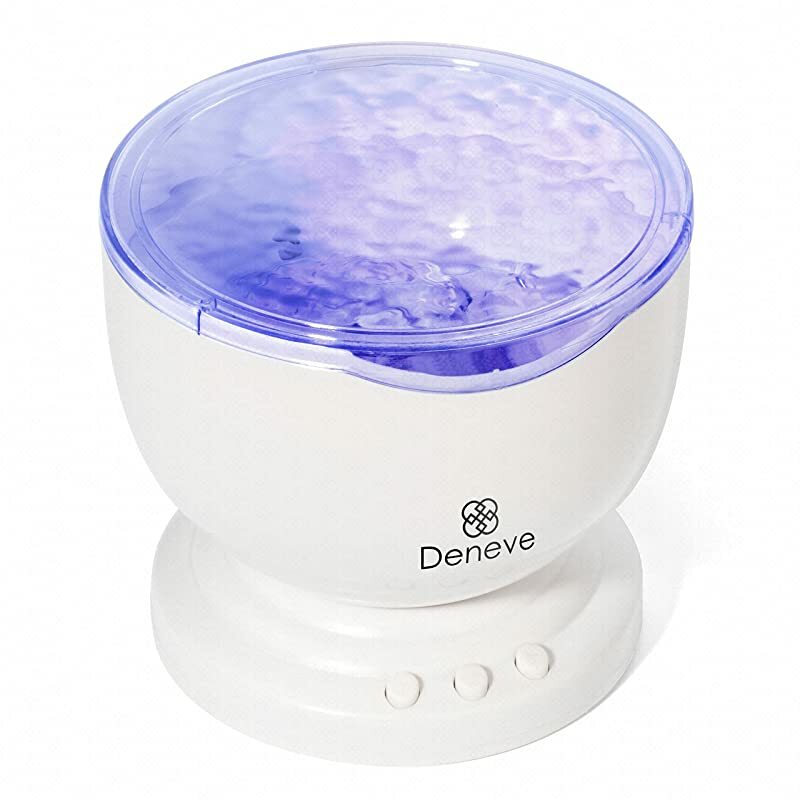 The relaxing waves fill the room with your child with a soft glow that is very soothing. The smooth movement makes it appear as if you are sleeping on a calm beach. It is a very pleasant experience. The projector is equipped with 12 different color LEDs so that you can program the color of your choice. It also can be connected to your phone, MP3 player or a tablet to project soothing music. The projector can be operated using three AAA batteries or can be plugged into a power outlet as well. It gives you the freedom of placing the projector wherever you want. Although most customers are happy with the projector, some have voiced minor complaints. The light can be a bit too bright for some people. If you want to get the projector to project light all over the ceiling, you have to tilt it at an angle manually. Although it is not that big deal, some people find it a bit annoying. If you find Aurora Borealis soothing and calming, this projector is for you. It is one of the most realistic aurora projectors that I have seen. It projects the northern lights on your ceiling in multiple colors that are mesmerizing to look at and to soothe at the same time. Some features that make it my favorite include the following. The effects of Aurora projection are very realistic. As a matter of fact, it is so realistic that for a moment you will forget that it is a mere projection and not the real thing! check the video below to see how the effect of this projector with and without the cover. The projector is equipped with eight different color LEDs to give you every possible Aurora shade. You can choose either a monochromatic red or green projection or a multicolored show. The unit comes in with built-in high-quality speakers. You can attach your phone or tablet via a USB cable (provided) and stream music, soothing nature sounds or lullaby. You can also adjust the volume to the level you want. The head of the globe is adjustable up to 45 degrees so that you can project the light on almost any wall or part of the ceiling you want. The projector enjoys positive reviews, but some customers have pointed out at some shortcomings of the products as well. Some colors are brighter than the others. Some people found the lights to be too bright. Baby light show projectors are one of the best ways to help your child relax and fall asleep. I hope that this detailed review/buying guide helped you to understand these products better so that you can make an informed purchase. The projectors reviewed here are some of the best baby light show projectors on the market, and you can’t go wrong with any one of them. So, don’t wait, check these projectors today and bit sleepless nights adieu! Photo & Video credits: Amazon, Daddoes, denevehome.com, Toy, Gadget and Product Reviews by Dad Does, lee gigima, Hashim Bajawi, lunalover49. one of the best reviews of anything i have seen. wish everyone had your thoughtfulness and completeness. Hope you infect all ratings sites! And seems you left out the category of projectors with changable cartridges, baby sound timers, and voice activation… Do you have a recommendation for those or are there none that were satisfactory to you?